The Indian banking industry reached new heights after the nationalization of banks in 1969.These banks called as Public sector bankshave helped to build India through the years.They paved way for various industrialization activities,infrastructure projects & to satisfy the personal needs of an average Indian citizen.Once you know how to prepare for bank exams,getting a job in such public sector banks is possible.We have listed some of the largest public sector banks in India,which will be useful for job positions search. 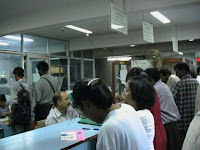 Reserve bank of India established on April 1, 1935 is the central banking authority in India,which aligns the banking operations across the country according to govt policies.Having presence in every state,the bank generates huge opportunities for deserving candidates.The bank also has special programme called 'Summer Placements'. Visit Jobs in RBI to know more about their career possibilities. State bank of India,one of the oldest banks of India has been a part of India`s transformation across decades.The SBI network is spread far and wide reaching out to millions of rural and urban Indians.With a strong presence and good business values,the bank has numerous mass recruitment drives to its credit.Enter Jobs in State bank of India to know about current openings. Union bank of India has come across ages from the Gandhian era to the modern banking period.The bank has transformed itself to keep pace with the new technologies like Mobile banking,Internet banking and Branch banking.Every year,the bank conducts drives to select deserving candidates for their branches.Visit Jobs in Union bank of India to check for latest recruitment details. I PLANNED TO APPLY FOR STEEL PLANT MANAGEMENT TRAINEE,VIZAG. IAM I ELIGIBALE TO APPLY FOR THIS POST. I am awaiting my final year results.Am i eligible for PO jobs or specialist officer job in central bank of india or in any bank? Yes,final year students can apply only if you are able to produce the necessary certificates at the time of written exams organised by the exams..
what really is the probationary officer job? is that on a contract basis for 2 years? what does the banks pay for po's? hello this is sumithra here .Am doing my MS-SOFTWARE ENGG.my percentage is 89%.Am i eligibile for bank officer post?.and how can i know the exam dates? Sumitra,Yes,you can join for Officers position in Banks.Keep visiting our site as we will list he dates,information on bank jobs in india . can u tell me which public sector bank recruits freshers as IT officers. I want to know status of Federal bank ltd from point of view of its existence and growth. i am realy thankful to bank jobs in india for such useful inf. i realy on u for inf a lot. but u dint updatd abt d result of new india assurance co. ltd. 2dy by chnc i chckd,,,i got 2 knw dat i cleard. u shud hv updatd dat also.